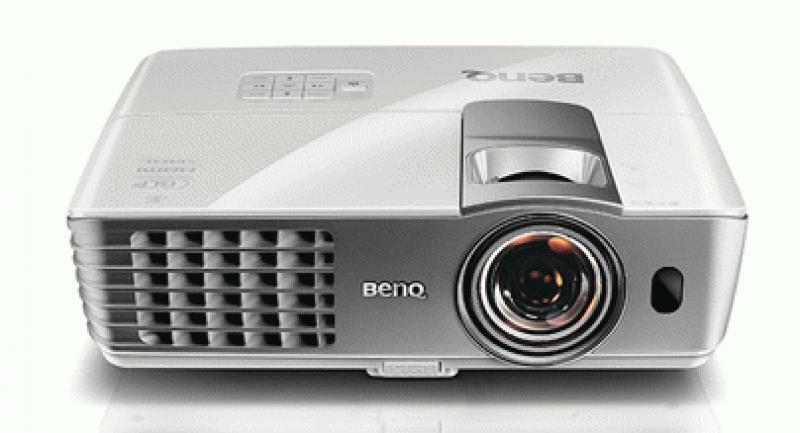 Late last year, BenQ introduced follow-ups to its popular W1070 and W1080ST DLP projectors, which have reached their end-of-life stage. (We reviewed the W1070 about two years ago.) Like their predecessors, the new HT1075 ($1,199) and HT1085ST ($1,299) are 1080p, 3D-capable, single-chip DLP projectors that use TI's DarkChip3 chip and a six-segment color wheel. They are billed as home entertainment projectors, meaning they are targeted less at the videophile with a dedicated theater room and more at the casual viewer who wants to enjoy big-screen viewing in a less light-controlled environment. As such, these projectors are designed to put out a good amount of light; both have a rated light output of 2,200 lumens (which is 200 lumens more than their predecessors) and a rated contrast ratio of 10,000:1. The other major differences between the old and new models are that the new ones support MHL and are compatible with BenQ's new Wireless FHD kit ($349) that allows you to wirelessly send the HDMI signal between source and display, through barriers at a distance up to 100 feet. BenQ sent me the HT1085ST for review. ST stands for short-throw. Spec-wise, the HT1085ST is practically identical to the HT1075, but its short-throw lens suits its for smaller rooms or situations where the projector must be placed closer to the screen. I was able to fill my 100-inch screen with the projector placed at a distance of just five feet away. While the HT1085ST has an MSRP of $1,299, its street price is closer to $900 through authorized sellers like VisualApex.com. The HT1085ST has a small, portable form factor, measuring 8.4 x 4.1 x 9.6 inches and weighing just 6.25 pounds. The cabinet has a glossy white finish with slightly rounded corners and three feet on its underside (more specifically, one stationary rear foot, one adjustable rear foot, and one front pedestal that, with the push of button, can raise or lower the front of the projector to aim the image at the screen). Generally speaking, home entertainment projectors are designed to be placed on a coffee table or other tabletop, but the HT1085ST also supports a ceiling-mount or rear-projection setup. The lens is located to the right side of the HT1085ST's cabinet, and the bottom of the projected image lands slightly above the center of the lens; the amount of vertical offset varies based on the size of the projected image (a 100-inch image has a vertical offset of about 1.2 inches). The HT1085ST lacks vertical and horizontal lens shifting (the lower-priced HT1075 has five percent vertical lens shifting), so the only image-positioning tools at your disposal are the manual 1.2x zoom ring, the aforementioned adjustable feet, and vertical/horizontal keystone correction. If you place this projector on a low-sitting coffee table, unless your screen is also fairly low to the ground, you will likely still need to engage some vertical keystone correction to correctly shape the image, which can hurt the picture detail. In my case, I placed the projector on a TV tray that sits about 26 inches high; it took quite a bit of tinkering with the projector's physical placement and the adjustable feet, but I was finally able to perfectly position the image on my 100-inch Visual Apex VAPEX9100SE motorized drop-down screen without having to engage keystone. The HT1085ST's back panel sports two HDMI inputs (one with MHL support to connect a compatible tablet or smartphone), one PC input, one component video input, and one composite video input. Like many home entertainment projectors, this one has a built-in 10-watt speaker, so the connection panel also includes a pair of stereo analog audio ins, a mini-jack in, and a mini-jack out. An RS-232 port and 12-volt trigger are included, as is a Type B USB port for service purposes. The newly added Type A USB input provides power to the wireless HDMI receiver but does not support media playback. The package includes an IR remote with full amber backlighting, an intuitive layout, and lots of direct access to desirable picture controls. Speaking of which, the HT1085ST is an ISF-certified projector, so it includes a nice assortment of advanced picture adjustments to calibrate the image. Adjustments include: five picture modes (bright, standard, cinema, user 1, and user2); four color temperature presets (normal, cool, lamp native, and warm) and RGB gain and offset controls to fine-tune the white balance; a full color management system with the ability to adjust the hue, saturation, and gain (brightness) of all six colors; nine gamma presets (from 1.6 to 2.8); a BrilliantColor mode to improve the color brightness; noise reduction; and three lamp modes (normal, economic, and SmartEco; BenQ lists a maximum lamp life at 6,000 hours). The HT1085ST does not have an auto iris that automatically adjusts the lens aperture to suit the image being displayed, nor does it offer a de-blur/de-judder "smoothing" mode. Because the projector includes a built-in speaker, it also offers preset sound modes and an adjustable EQ. The speaker has decent dynamics for casual listening, but the sound quality, particularly with vocals, is somewhat hollow and unnatural. Then again, I'd say it's on par with most internal TV speakers, which is really what it's trying to compete against. BenQ sent along a sample of the optional Wireless FHD kit, so I did try it out during my evaluation. The transmitter unit includes two HDMI inputs and one HDMI output, so you can pass the source signal through to another display (a nice benefit if you use both a TV and projector). The receiver unit has a single HDMI output to connect to the projector, and the included power cord can be connected to an outlet or, as I mentioned above, directly to the HT1085ST's Type A USB input. BenQ includes a simple remote that allows you to switch between the two HDMI inputs on the transmitter. The kit allows for the transmission of uncompressed 1080p video and multichannel audio up to 100 feet without requiring line of sight. Like many home entertainment projectors, the HT1085ST is quite bright, putting out 34.7 foot-lamberts with a 100-IRE full-white pattern on my 100-inch, 1.1-gain screen. That's in the Eco lamp mode, which isn't too noisy in its operation. The Standard and User modes are set to be brighter out of the box, using the notably louder Standard lamp mode to produce about 50 ft-L. I was able to watch well-saturated HDTV and sports content in the Cinema mode with the room lights on; mate this projector with an ambient-light rejecting screen material, and you'd get even better results. For those who opt to calibrate this projector, the results can be quite good. As you'll see in the measurement charts, using the Cinema mode as a starting point, I was able to lower the gray-scale Delta Error to just 2.38, with a more even color balance and a more theater-appropriate gamma average of 2.32. The RGB gain control did not appear to work, but my adjustments to the RGB offset control did make an across-the-board improvement. The color management system worked better here than in other "home entertainment" projectors I've tested (at least in the Cinema picture mode, more on this below), so I was able to dial in accurate colors, all with a Delta Error under two. The combination of a pleasing accurate image and good light output makes for an engaging HDTV experience, particularly with sports, gaming, and brighter HDTV content. The primary performance limitation of most home entertainment projectors is their black level. All of that light output means it's difficult to achieve a dark black level for movie-watching in a dark room. In this respect, the BenQ is a step above entry-level competitors like the Epson Home Cinema 2030 LCD projector. No, it could not rival my more expensive reference projector, the Epson Home Cinema 5020UB, in a head-to-head comparison of dark demo scenes from Gravity (chapter four), The Bourne Supremacy (chapter one), and Flags of Our Fathers (chapter two), lacking that higher level of contrast and image depth that you get from a good home theater projector. Nevertheless, the HT1085ST's black level was above average for its price category, producing a respectably saturated film image with the nice sense of texture that DLP delivers, and its ability to render fine black detail was very good. Whether I watched 1080p Blu-rays, 1080i HDTV, or 480i DVDs, the HT1085ST served up a well-detailed image, as long as I avoided the keystone correction. This little BenQ actually did a better job than the Epson 5020UB in the detail department when upconverting 480i DVDs. In other processing areas, though, the BenQ wasn't quite as strong. It did correctly pick up the 3:2 film cadence in 480i and 1080i test patterns, but it failed to properly detect video-based and other assorted cadences--which means that film-based DVD and HDTV content will look generally clean and artifact-free, but you'll probably see some jaggies and moire in video-based signals. The projector serves up a pretty clean image without an excessive amount of noise in solid-colored backgrounds and low-light scenes (with noise reduction set to 1). As I mentioned in the Hookup section, there's no de-blur/de-judder option here, so fans of a smoothing mode or the Soap Opera Effect should look elsewhere. In the motion-resolution test pattern on my FPD Benchmark disc, the HT1085ST produced some visible lines at HD720 but not HD1080, which is on par with its competition. In the 3D realm, this projector uses DLP Link technology, so no external 3D emitter is necessary. BenQ sent along the "3D Glasses II" active glasses, which can communicate with the HT1085ST at a distance up to 10 meters (32 feet) without line of sight. There's only one picture mode for 3D content, but the full slate of calibration tools are available within it. The 3D image is quite red, so the glasses have a stronger green tint than usual to compensate. When I first queued up chapter 13 of the Monsters vs. Aliens 3D Blu-ray disc, I saw a lot of crosstalk, and the image looked a little distorted. I went into the menu and hit the 3D Sync Invert option, and everything snapped into focus. From then on, I saw virtually no crosstalk in my demo scenes. The projector was bright enough to produce an fairly engaging 3D image, but the colors were a little flat, and the picture lacked that extra degree of depth and saturation that you can get from a higher-end home theater projector.